Why do we stop reading classics after graduating from college? Why do we limit our literature analysis to that particular time of our lives, especially in high school, when we really skimmed through, barely understood and hardly reflected on books that become nonetheless milestones in our understanding of academics and life? I remember overhearing a guy at Starbucks telling his friend: "its a Catch 22...." I had to urge to interrupt their conversation and tell them: "have you read Catch 22? I have tried to read and understand it, but never finished the book because it is a boring book about World War Aviation. Ok you use the term quite openly but I won't allow myself to use it as I haven't earned it. I would rather say: I can't have the cake and eat it." I did read Waiting for Godot. Again a boring read, as best described by its title. 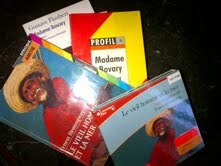 A friend was startled that I was reading Madame Bovary. "A scandalous book about an adulterous woman!" I replied: "Flaubert was the first feminist! He exclaimed that "Madame Bovary c'est moi", thus taking full responsibility for his heroine's actions and feelings. Despite the fact that I read Madame Bovary when I was a teenager, I do remember that the book is more about feelings than about actions, that the woman's "crime" all took place in her fantasies, that she lived by her dreams and her disillusions, that she didn't really deserve the A "scarlett letter" of Nathaniel Hawthorne. I will find out by reading it again, as an adult seeking answers and confirmations to my memories of "immature" reading. I was even younger when I read The Old Man and the Sea in a summer class in the United States. I remember skimming the book because it was boring for a teenager who only enjoyed books with female heroines. An Old Man? I couldn't understand Hemingway then! My son selected it as a vacation read school assignment. He read it in French translation, with me in interested tow. We got an audio book and listened to it together and we discussed it. I think he understood more than I ever did when I was a school girl because he had a maternal reading club! I must mention that Madame Bovary opens with a chapter about Monsieur Bovary, the husband she would eventually betray. He fell for her when he was still married, before his first wife died. And what comes around goes around, she also fell for someone while she was married....but I have not gotten to that part yet! Flaubert reads rich, but tasty! His descriptions have the brush stroke of Impressionists but carry the detail of the Realists. I enjoyed reading Hemingway's as a kid and I was dazzled with the determination of the old man to catch the monster fish,and then drag iits skeleton to show off at the port. I am not blessed with the French Bility to read Bovary,but I wouldn't mind watching it as a movie on Arte channel. As to throwing sentences to show off,it is acceptable because the importance is to rightly use it in context like in Kafka 's metamorphosis..
Dr Okaya cast a lottery spell for me and i won $50 million US dollars..Read my review and contact him now for your own lottery winning numbers.